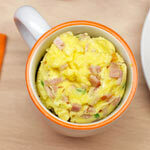 Combine the eggs, milk, water, salt and pepper (to taste) in a bowl; whisk together. Spray a 12-inch skillet with non-stick cooking spray; heat pan over medium high heat. Add the oil, swirling to coat pan. Add eggs; cook until the bottom is set, lifting edges of omelet and tilting skillet to allow eggs to flow beneath to cook, about 8 minutes. 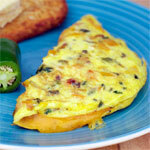 Top eggs with cheese, spinach and fresh herbs; fold omelet in half. Continue cooking until cheese melts and spinach wilts, about 2 minutes. Nutritional information per serving: 308 calories, 67% calories from fat, 23 g fat, 7 g saturated fat, 3 g carbs and 23 g protein. I got this recipe from our local paper The Press Enterprise in an article called "Fresh Herbs Make Omelet Appealing" by Renee Enna. I thought I better give her credit since I didn't invent it. I did make it though and it's wonderful. The face on the omelet is what made me do it, but it also turned out that it tasted really good. I love your website and use it often. I'm happy to finally contribute something. I hope you like it. I'll be coming back to see the comments people put in. 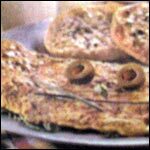 Make an herb omelet more appealing to kids by adding olive eyes and a chive mouth. 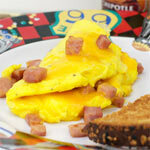 What do you think of Herbie The Omelet? Very nice. Did not have tarragon but it was still full of flavor. I love the olive face idea. Thanks for posting.